Sunnyvale bail bonds can be incredibly useful when you’re in a pinch. Being arrested is never fun. Your head may be spinning from all of the confusion. The worst part is that you may have been placed in jail until you can post bail. Since you may be unable to gather the necessary cash, you may need help from a trusted Sunnyvale bail bonds company. 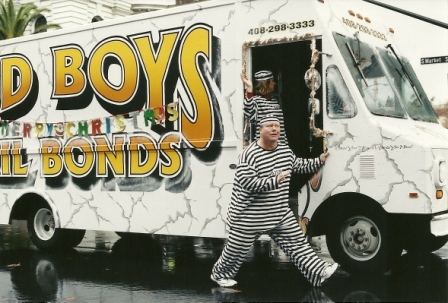 At Bad Boys Bail Bonds, we try to remove the hassle from the situation. No matter the amount of money that you need, we will be happy to provide assistance. What is the Sunnyvale Bail Bonds Process? After you have been arrested, you will be taken into custody and will face a judge who will set your bail. He or she will review your case and criminal history, and an amount will be determined. Thanks to a Sunnyvale bail bondsman, your financial burdens will not be a concern. In no time, we will post your bond so that you will be free to return to your normal life. When you need help, you want to work with a Sunnyvale bail bonds company that will be able to service your needs quickly. At Bad Boys Bail Bonds, we are available 24 hours a day. We will handle all of the paperwork and take the confusion out of the process. Bail bonds in Sunnyvale ensure the court that a defendant will appear at trial. It is the responsibility of the client to maintain correspondence with the bondsman until the court date. When contacting a Sunnyvale bail bondsman, it is important to have pertinent information available. For example, a bondsman will need to know where the defendant is being held, a booking number, and the monetary amount that is required. There are many companies that post bail bonds in Sunnyvale, but it is crucial to contact the most trusted name in the business. At Bad Boys Bail Bonds, we work dependably so that our clients are never inconvenienced. In California, bond fees are set at 10 percent of the total due amount. We offer a small discount to qualifying applicants. When you are in a bind, choose our team for assistance. Call us at 1-800-BAIL-OUT.